Koroma, Salia, Sierra Leonean accordionist and singer; b. Segbwema, Sierra Leone, 1903; d. ? Koroma, born among the Mende people in southeastern Sierra Leone, embarked on his musical career at the behest of his father who was also an accordionist. In lieu of the British-style education offered by the country’s colonial government, Koroma studied music under the guidance of a number of his father’s apprentices. He struck out on his own in his early twenties, moving from town to town under the patronage of a succession of Mende chiefs. Implicit in such relationships was the creation of praise songs to honor the patron, but Koroma also performed traditional Mende folk music and other songs he composed based on his observations of life. Koroma rose to national prominence in the 1950s when, in an effort to expand its library of indigenous music, the Sierra Leone Broadcasting Service invited him to the capital, Freetown, to record some of his songs for broadcast. Copies of the tapes fell surreptitiously into the hands of a transplanted Nigerian named Jonathan Adenuga who had just opened a recording studio in Freetown. Adenuga issued the songs as 78 RPM discs on his Nugatone label, thus earning Koroma a second payday for the same work. Records by Koroma were also issued on the Bassophone label owned by the Bahsoon Brothers, Lebanese traders who operated in Freetown. Koroma, his wife, and their son eventually settled in Kenema in southern Sierra Leone where he continued to perform well into his eighties. With the onset of civil war which broke out in 1991, contact with Koroma was lost. He is presumed to have died in the nineties, either from old age or war. 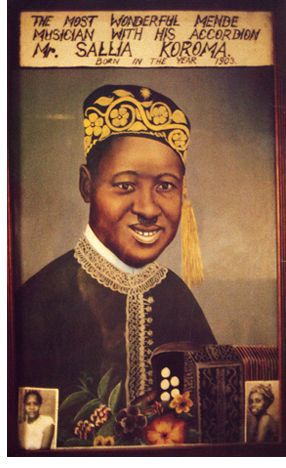 Koroma was the last of the musicians, like Congo’s Camille Feruzi, who embraced the accordion in colonial times before the influx of cheap guitars rendered it passé. He was a prominent figure in Sierra Leone for much of the twentieth century, at first cultural knowledge. H. Hinzen, Salia Koroma: My Life Story (Freetown, 1985).